This species is accepted, and its native range is W. & SW. Tanzania to N. Malawi. Evergreen tree ± 5 m high, closely resembling C uloloma Brenan (see above) and indistinguishable vegetatively, differing in the inconspicuous bracts, more slender pedicels (± 0.5 mm thick, not 0.2–0.3 mm thick), flowers green (not whitish, pinkish or yellowish brown), the bowl-shaped perianth tube, ± 3.5 mm diameter at apex (not cupshaped, ± 2–2.3 mm diam at apex) and the ascending, not patent, perianth lobes, anthers 7, not 5, carpels 6–7 not 3–5. The fruits and seeds of C chlorantha are unknown. 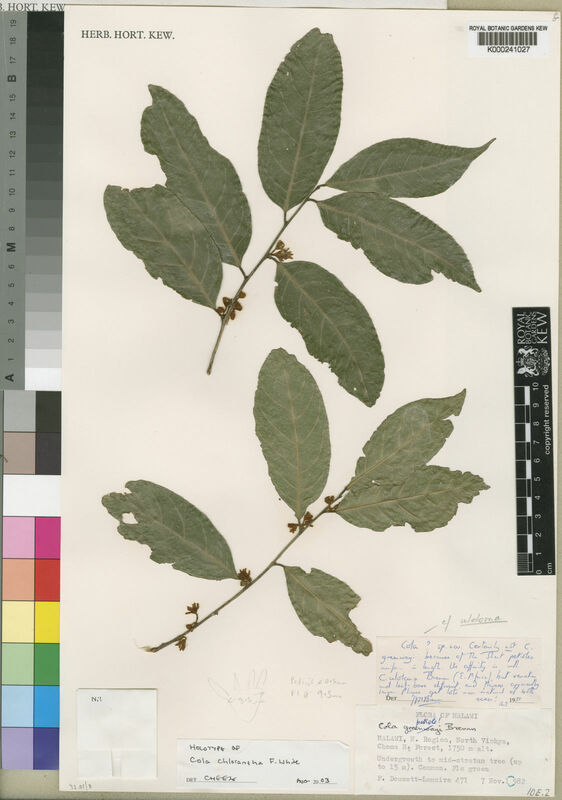 Cola chlorantha is only known from three widely separated sites, at which a decline in habitat is inferred. It is here assessed as VU B2a,b(iii), i.e. vulnerable, in view of the data above, and the area of occupancy being estimated at less than 2,000 km2. More observations are needed on the status of this species at the sites indicated.